A North Korean company says it has developed a tablet computer based on Google’s Android operating system, according to reports from the 8th Pyongyang Autumn International Trade Fair currently taking place. 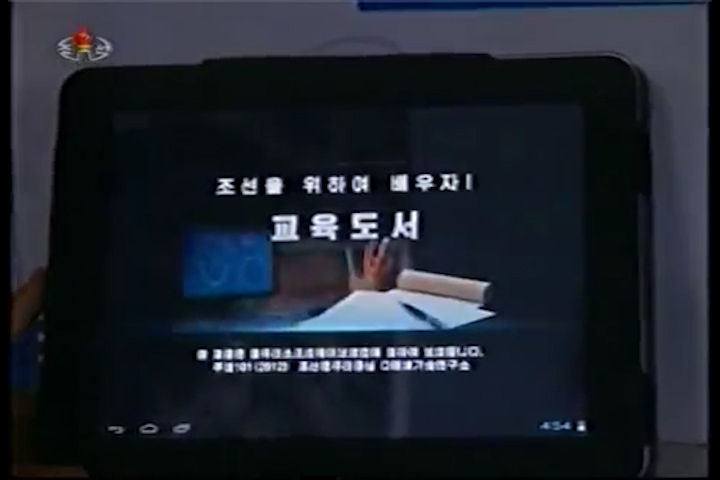 There’s little actual information on the tablet computer, which was shown in photo coverage by the Associated Press and North Korean state TV. It’s made by a company called “Chosun Computer,” which doesn’t appear to have received any previous coverage in western or North Korean media. You can see the AP photo on The Wall Street Journal’s Korea Realtime blog, which also talks about the computer. The AP didn’t run a story from the trade fair, which takes place in Pyongyang twice a year, so we’ve only got details from the photo caption and there’s not really anything there. 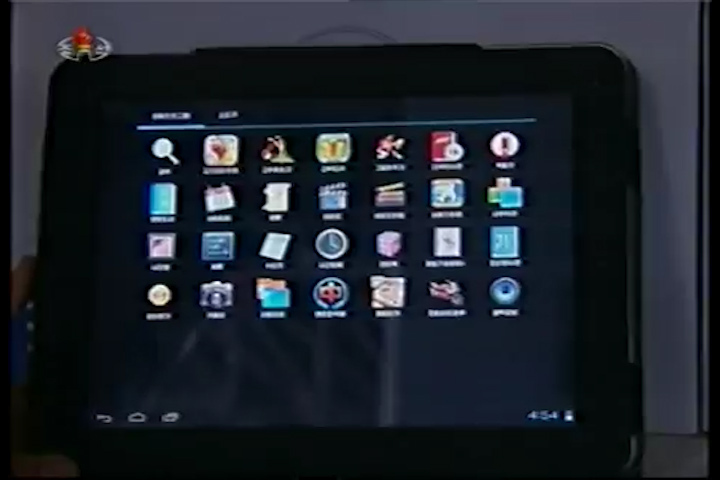 The style and design of the tablet PC’s home screen gives away its Android operating system base. The Wall Street Journal reached out to Google’s Seoul office, which told the newspaper “it’s possible the North Korean company is legally using Android because it is open-source software.” But that fails to take into account export controls. Android is based on Linux and offered by Google as open-source software. It’s distributed under the Apache License, which includes the following warning. The Apache Software Foundation (ASF) is a 501(c)3 nonprofit charity based in the United States of America. All of our products are developed via online collaboration in public forums and distributed from a central server within the U.S. Therefore, U.S. export laws and regulations apply to our distributions and remain in force as products and technology are re-exported to different parties and places around the world. ASF software and/or technical data may NOT be exported/reexported, either directly or indirectly, to any destination subject to U.S. embargoes or trade sanctions unless formally authorized by the U.S. Government. — Apache Software Foundation export restrictions. So, ASF software is governed by export controls, but I’m not knowledgeable enough to interpret them. If anyone knows whether Android falls under U.S. export controls, please email me or leave details in the comments. In the right-hand picture on the second row, some of the common Android icons can be seen, including those for the clock, media player, camera, gallery, and settings. There aren’t any icons for email, web or other Internet-based services of course because North Koreans aren’t permitted access to the Internet. Instead the tablet seems to be promoted for offline applications like reading digital books. 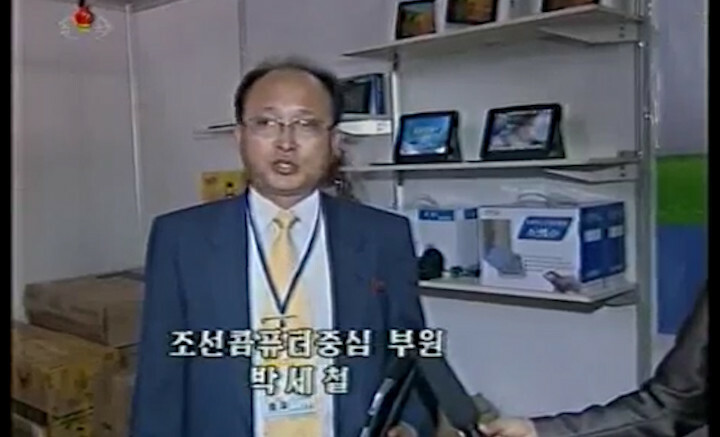 The Wall Street Journal notes the “Samjiyon” name on the boxes on the shelf of the booth. 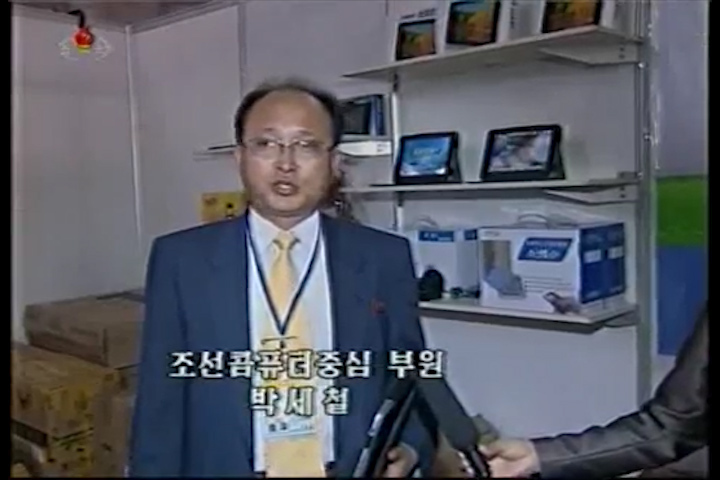 That’s the same name as a tablet first reported by the Dong-a-Ilbo back in June. Read more about that on The Marmot’s Hole blog. It’s worth noting that this is a different tablet computer from one I covered in July. That computer was called “Achim” and came from a company with the generic name “Electronics Development Company,” according to KCNA. 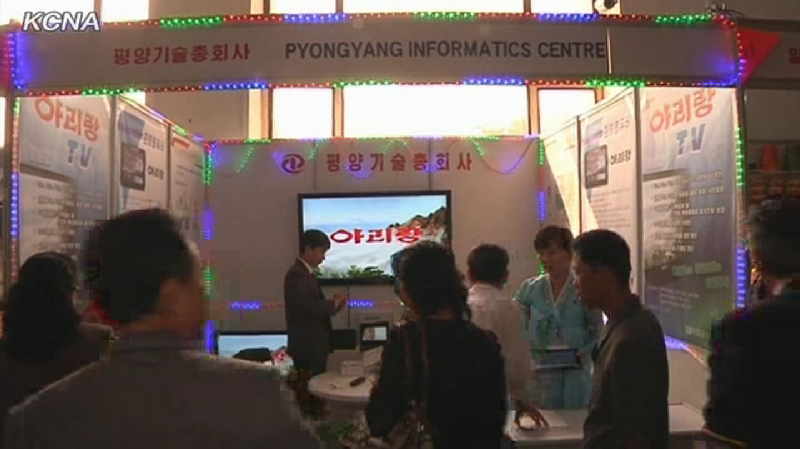 The “Samjiyon” wasn’t the only computer equipment on show at the Pyongyang Autumn International Trade Fair. 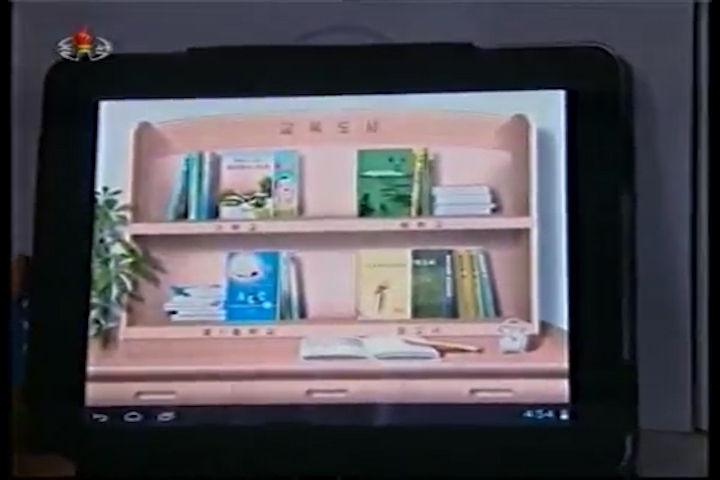 From video posted by KCNA, it appears the Pyongyang Informatics Center was also demonstrating a tablet PC. 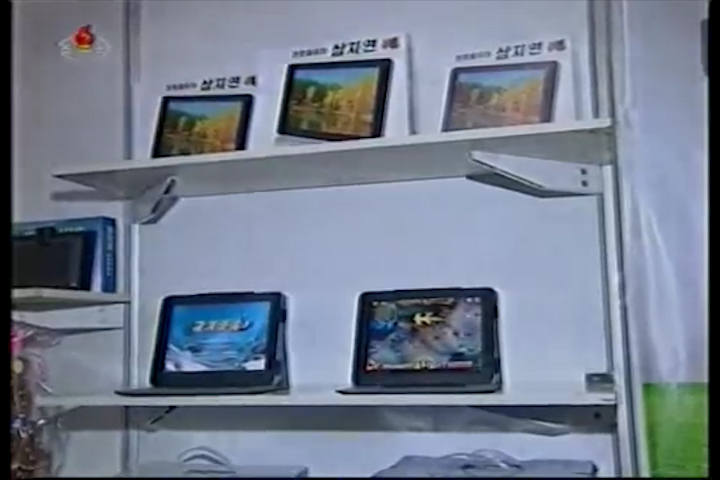 5 Comments on "Samjiyon Android tablet debuts at Pyongyang trade fair"
It would be interesting to know *how* they got development software and the Android source code without being able to access the Internet. What use is a tablet without internet? It’s like owning a phone with no SIM card slot. North Korea is under sanctions. They’re not even supposed to have this. It’s an open-source OS based on Linux kernel. The differences in license scheme (as opposed to GNU Public License, which is less restrictive than Apache) does not change the fact that anyone can obtain source code. That does not mean Google or Open Handset Alliance is “exporting” the code to DPRK. Rather it could be considered a software piracy by the KCC (it is KCC that is using the source code in violation of the Apache license). But what are they going to do? It’s mostly unenforceable and even it were, it’s not worth Google’s time. In any case, it is most likely one of those “China tablet” makers in Shenzhen — the same companies that export under-$100 range Android tablets to the U.S. — that OEMed the tablet to KCC. So the OS was installed by a company in China, which isn’t under any sanction.